V-44 Marine Raider Bowie Knife & Sheath | BUDK.com - Knives & Swords At The Lowest Prices! 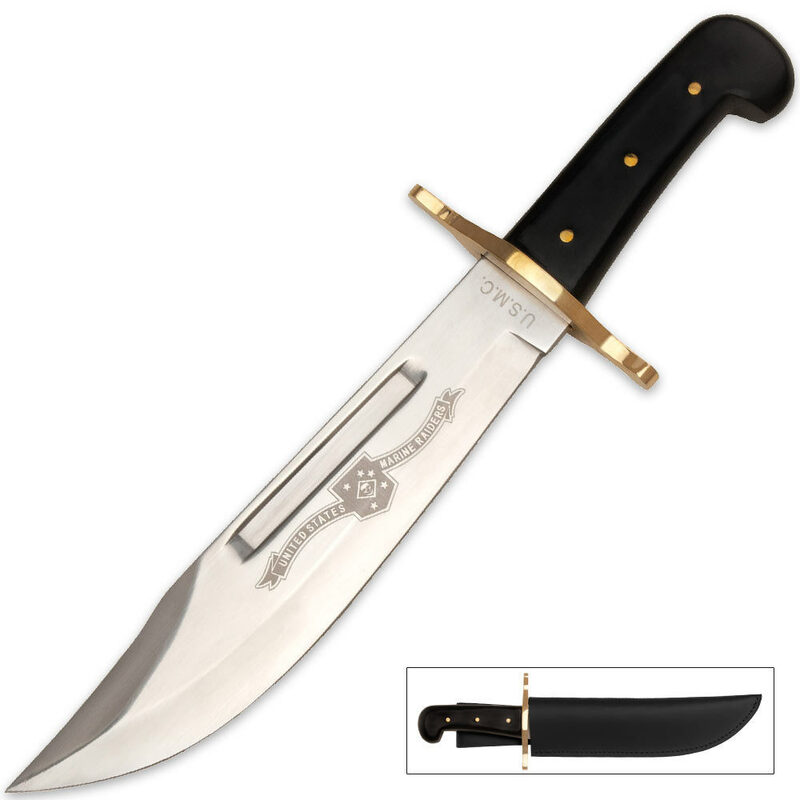 This V44 Raider Bowie is an authentic replica of the V44 Bowie used by the United States Marine Corps in World War II. Comes packaged in a custom box with the original story and specs of the V44. Awesome antique Knife from USMC The Marines The WWII 40's Beautiful work and Decent Knife Stanley steel and Brass handle, Sometimes is greatt to cut and make slide my Watermelons. The knife I got has some flaws. There is also a distinct line near the hilt where the steel changes from bright & shiny to dull & streaked. Not sure what did this, some kind of chemical or a not very good buff out, or it wasn't dipped all the way? Not sure, really it probably comes down to cheap labor. Knife also arrived really DULL. On the plus side, the issues are cosmetic only. I like the knife, I even like the sheath, although it does not have a retention strap (I added one easily), it is very heavy duty leather and fits the knife well. If you wear it vertically, shouldn't be a problem that there's no retention. I have medium size hands, so the grip is really good for me, fits snug & feels very secure. If you have large hands, the handle might be a bit small for you. Even though it was made in China, I like that it is a sort of historical tribute to the Marine Raiders of WWII, particularly those that served in the Pacific theater (that's why I bought it). Given the price, the cosmetic flaws aren't enough for me to tell you not to get this knife, I would recommend it if you don't mind doing some buffing & sharpening, that is, if you want it to be flawless. I also got the Case sheath other reviewers mentioned, and I REALLY like that. Great fit for this knife & a really nice sheath. After about 2 hours of elbow grease, I now have a knife that I am really happy with & might even show to some of friends that are retired Marines. Great reproduction! Awesome! I'm going to get more for gifts! as for the knife i give it 5 stars all day long ive taken it into the woods several times and beat the crap out of it and it keeps on ticking. they sheathe is rubbish get the sheathe for the case bowie just be careful. the knife needs a decent sharpening when hou first get it but thats to be expected. all in all a decent knife if you want to put the work in. not to mention that it has both military and historical appeal. I have to agree with some of the other reviews on here about the handle and the sheath. I have big hands so my hand fits snuggly on this handle with no room to move. I won't have to worry about my hand slipping off of it that's for sure! I'd rather have a little bigger handle though. The sheath that comes with it is a nice and sturdy design, just no way to fasten the knife down. I purchased the Case Sheath (Item No. 01 CA50419). This sheath works great with this knife. Almost like it was designed specifically for this knife. The knife was fairly sharp out of the box. I put it on an electric sharpener and worked with it for a while with my sharpening steels and really put a nice edge on it. It slices computer paper like it's hot butter! I also polished the blade up with some Brasso and stropped it to really bring out the shine. If the handle were a litter bigger, I'd give this a 5 or even higher rating. All in all though, I highly recommend this knife for the price that is listed. This is a BIG BAD BOWIE. Well designed and a great quality and value for the price. The blade is thick and strong. The USMC Logo is deeply engraved at the guard. The laser printed logo is nice. Several of my customers have engraved the blade for gift giving. Try one, you won't be disappointed. Great knife. I compared it to a major competitor, who has been producing a similar bowie for years. This is the real deal. It's size is impressive and the price is 1/4 of the other brand. This is my favorite knife in my collection hands down. Not only is it solid, durable, and well made, it was an incredible value. It is too beautiful and impressive to ever use, so I will display it proudly. Very large knife. Seems to be very well made. Blade is pretty sharp right out of the box.Its a very good looking knife. I'll probably look around for a better sheath as the one provided doesn't have a snap lock on it to hold the knife in. Its still worth a 5 star rating. I purchased two V44 Bowie Knifes. The price was right. One for myself, the second one for my brother. The knife makes a great display in any office, if you can claim the few, and the proud. Don't get me wrong, I purchased this Bowie with the intent of carring it in the field. I'm a hunter, hiker, and outdoorsman. This knife is solid and can hold a sharp edge. I was not a raider, but once a Marine, always a Marine.